Gen JS Plasmodiophora has single specie. Plasmodiophora brassicae. It is intracellular parasite in the roots of members of family brassicae like cabbage. turnips etc. It causes disease club roots or linger-and­toe disease. In this disease the roots are swelled and become club like. This fungus is present in the form of mass of protoplasmic bodies in the infected roots. Each plasmodium contains thirty nuclei. These nuclei are haploid. Krankheitsherd formation: The infected host cells grow to fora– a giant cell. It divides to form daughter cells. 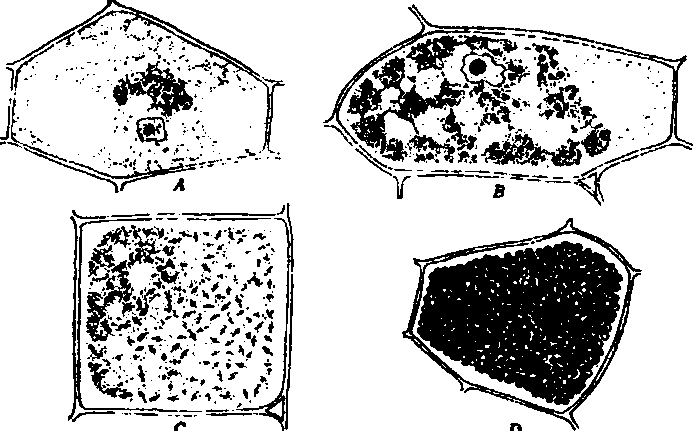 Plasmodiophora also divides with host cells. Thus each cell gets new Plasmodiophora. This process repeated. Thus group ofinfected cells are formed. This group of infected cells is called Krankbeitsherds. It spread infection to large number of cells. Asexual reproduction occurs by zoospore formation. Zoospores are produced in the infected host cells. Spore formation: Many mitotic divisions occur in the haploid nuclzus of Plasmodiophora. Thus it becomes multinucleate. The body of Plasmodiophora is divided into large number of uninucleate piec:s. These pieces secretes wall of chitin and become spores. 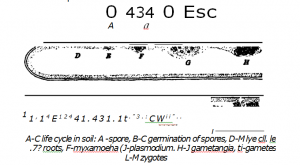 The root tissues of host disintegrate and release sporef Spores pass unfavourable conditions. Zoospore formation: The spores germinate in spring and form zoospores. Zoospores are naked uninucleate, pear shaped. They have single flagella. 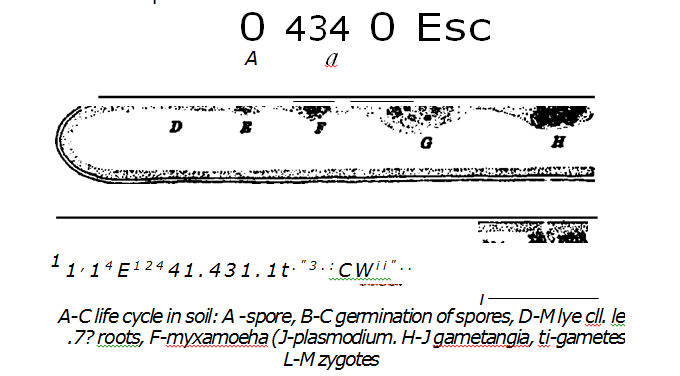 Myxamoeba: Zoospores penetrate into the host root through root–, hairs. The zoospore loses its flagella. It becomes amoeboid in shape. It is now called myxamoeba. Myxamoeba penetrates into new host tissues. Myxamoeba increases in size. Its nucleus divides repeatedly and it is changed in to multinucleate proplast called plas.nodium. I. 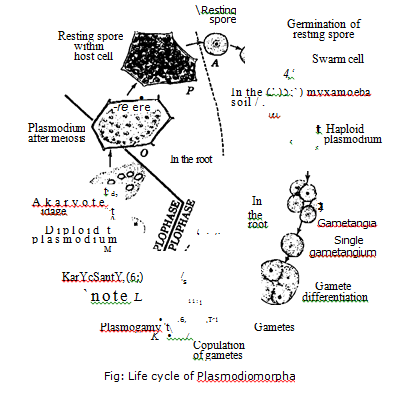 Formation of planogametes: The protoplast of plasmodium splits into many pieces in host cells. Each piece has one haploid nucl :us. Each protoplast is surrounded by a thin colourless wall and develops into gametangium. The nucleus divides mitotically and eight nuclei are formed. 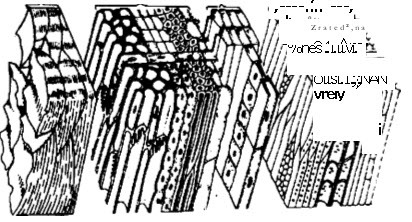 The protoplast of gametangium divides into frag nents. Each fragment gets one nuclei. Each fragment become spindle shaped and develops flagella. Now these arc called plat ogametes. Formation of diploid myxamoeba and plasmodium: Planogametes are released in the host cells. They fuse in pairs to form diploid zygotes. The zygote loses flagella and become myxamoeba. 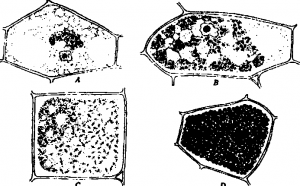 The myxamoeba divides many times by mitosis and form diploid plasmodium. infection of plasmodium: The diploid plasmodia migrate from cell to cell in the host tissues. Some plasmodia reach cambium cells of the host. They reach in the cells. They multiply in the cortex of root cells. The infected cortical cells enlarge very much. This conuition is called hypertrophy. It causes enlarged club roots. 4. Haploid spore and zoospore formation: The diploid zygote full) tills up the host cells. Its nuclei undergo repeated divisions (protomitosis). These are mitotic division. But the last division is meiotic. Plasmodium divides and many haploid spores are produced. These spores are librated in the soil by the disintegration of root cell,— They germinate to form zoospores in the soil. Zoospores infect the 2 •oung seedlings. Plamodiophora shows distinct alternation of generation. The diploid zygote and diploid plasmodium represents sporophytic generation. The haploid plasmodium, resting spores, gametangia and gametes represents the gametophytic generation. Both these generations alternates with each other.